As part of our preparations for programming the new simulator when it becomes active next year, we have spent some hours looking through the Working Timetables we have for May 1975 to May 1976. We concentrated on a 'typical' weekday as this saw more trains, particularly passenger ones, than Saturdays or Sundays. 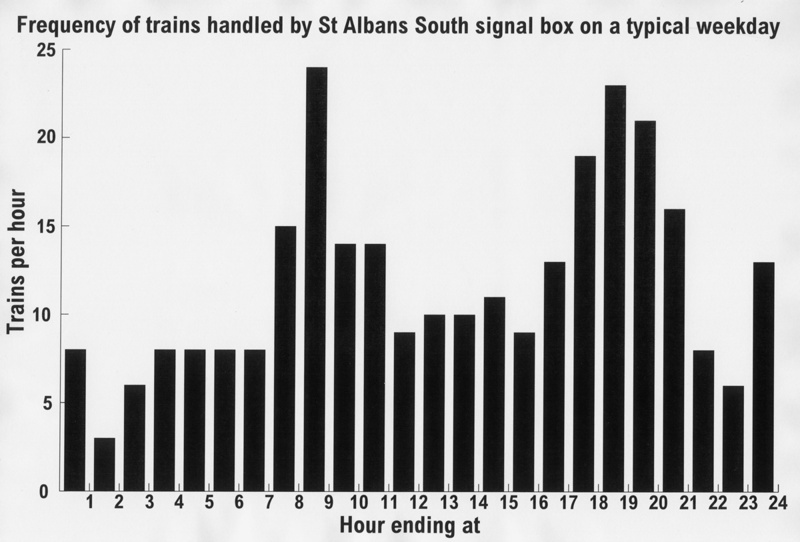 The chart right shows the number of trains in each hour of the day, going from 3 trains between 1 and 2am to 24 trains between 8 and 9am. The evening peak 'hour' is more spread out than the morning rush, partly because there were more mail, parcel and newspaper trains in the evening. 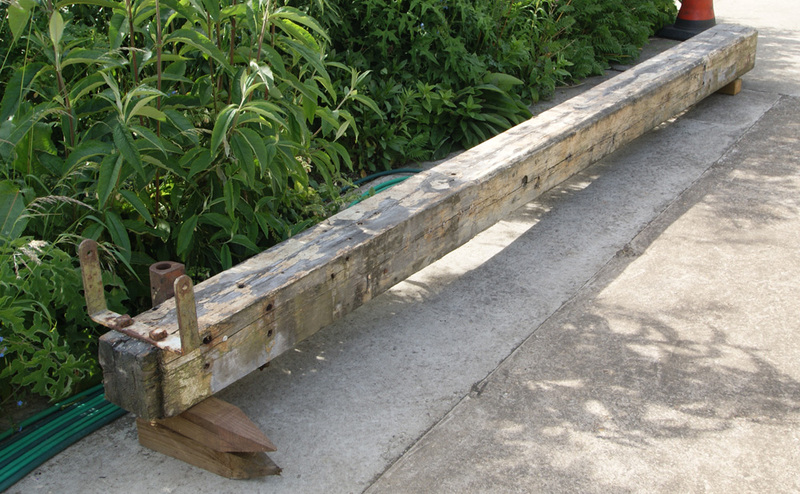 We had been thinking about obtaining a Midland Railway lower-quadrant signal to place in the garden and work from the box. So this year we have been collecting a number of items to put together to make such a signal. But all has been now been thrown into confusion by the National Railway Museum announcing that they have a large quantity of surplus signalling equipment to dispose of! Three of our members have been and looked at what's available and we await a decision from the museum Trustees later in the year about our requests. 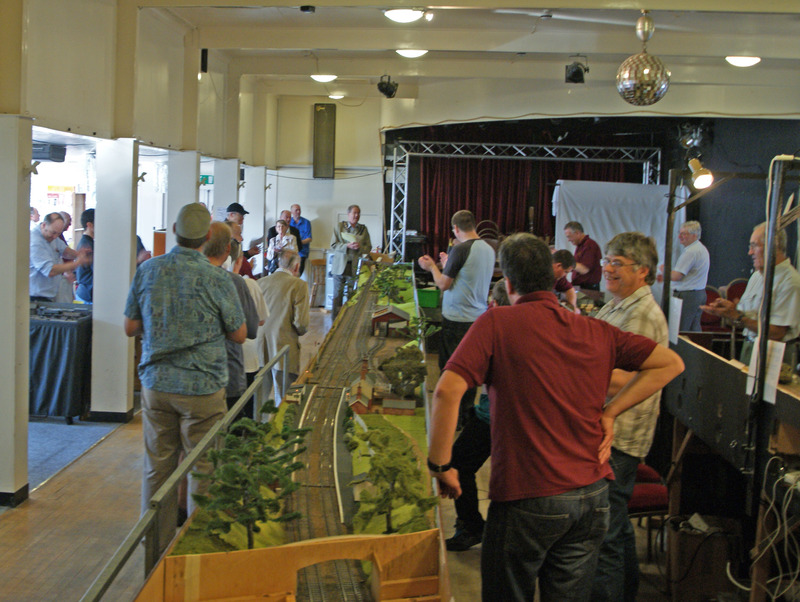 We were invited to attend this show, being held to unveil the new Gauge 0 model of the long-lost Harpenden East station, made by the Gauge 0 section of the Luton Model Railway club. Seen right is the Mayor of Harpenden formally opening the exhibition - he's at the far end of the 52ft long Harpenden East model. We were just behind where the photo was taken from, so everybody had to pass our stand far right to get to several other exhibits, the refreshments and the toilets. 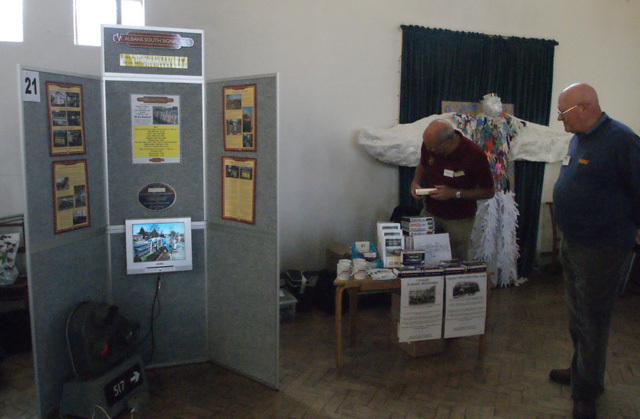 So we spoke to some 300 people, gave out about 150 leaflets and sold over £150 of videos, coal and wagons. We had our usual extended opening for this event, plus some special attractions. Downstairs on the ground floor there was a display about the former engine shed at St Albans, illustrated with photos of many of the engines that had been allocated there. 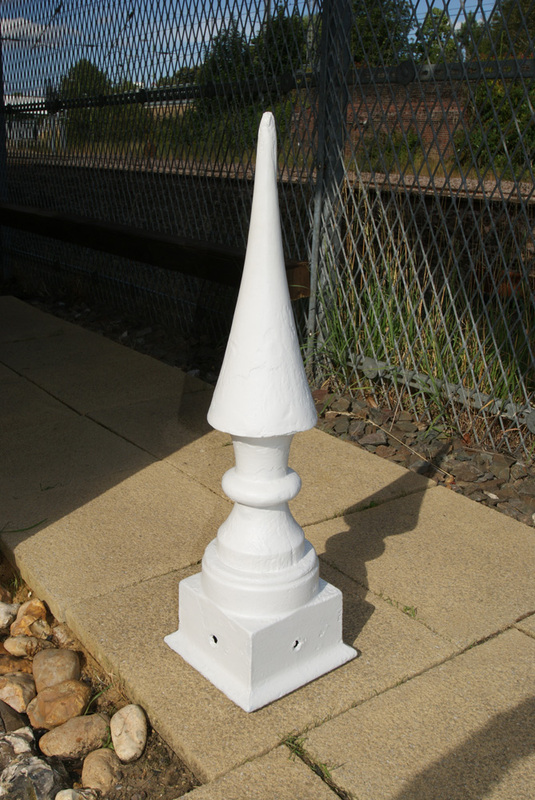 Outside there was a display of British Railways Totems from stations on the line between St Pancras and Bedford (upper) and outside in the car park AlbanRail, a local company, had set up an impressive lot of garden railway equipment (lower). Unfortunately only around 330 people visited compared to 600+ last year. The booklet detailing open places was not circulated to all households as in previous years and we were left off the 'Giant Monopoly' game this year as well! On the plus side the smaller number of visitors allowed more time for demonstrations and chatting. 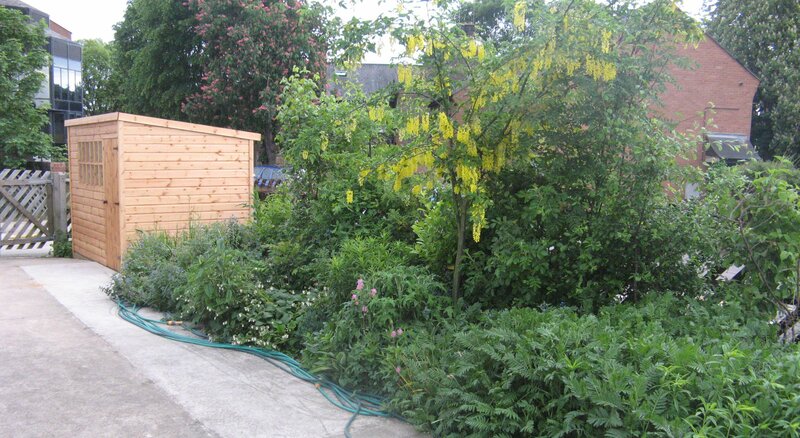 Lord Faulkner and the HRA Trustees "impressed by the quality and dedication of the membership and the support given by our families"
Sunny days through April (the dryest on record) make for more improvements. 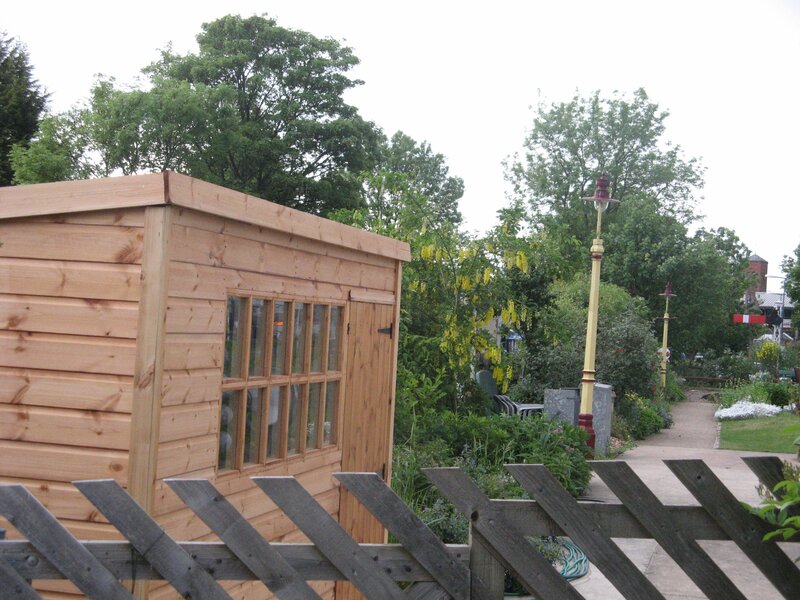 Our new shed arrived (6th May) and has been erected on a new base by the south gate. Used to store garden tools and tents, this frees up the lamp-hut for storage of artifacts and items from the box. 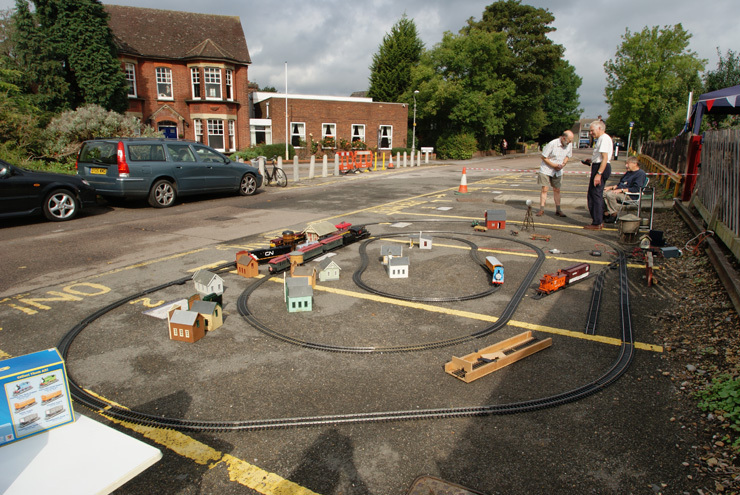 The Signal Box was invited to attend the John Keeble Church Model Railway Show in the Edgeware/Mill Hill area. 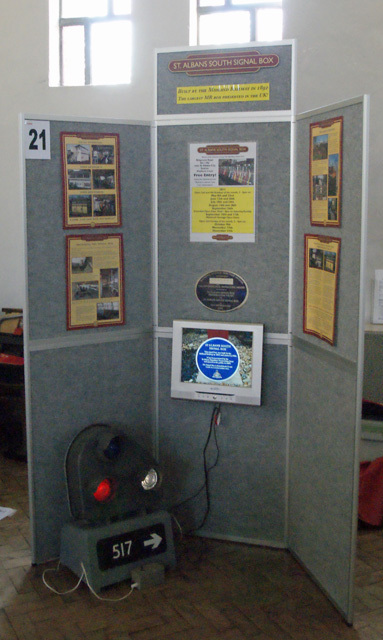 The pictures shown here are a general view of our stand and a close-up of our new display boards, in use for the first time. Also on display was our Ground Position Light signal on a new 'concrete' base. 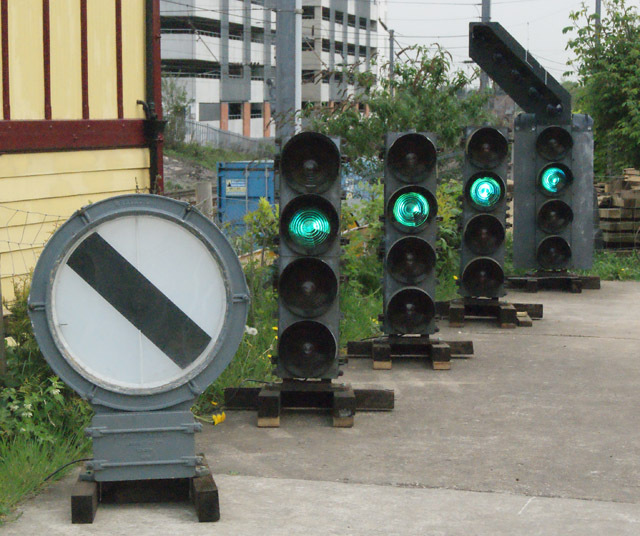 The pictures adjacent are daylight shots of the signals shown below and demonstrate how even in daylight (and with bulbs a fifth of the original wattage!) the signals are still very visible. 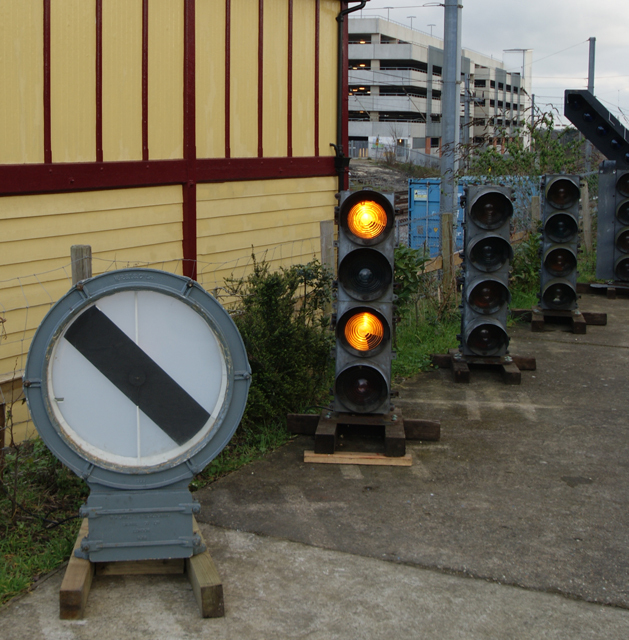 The colour light signal demonstration was completed at the start of April. The adjacent pictures were taken one evening after the completion of the works. 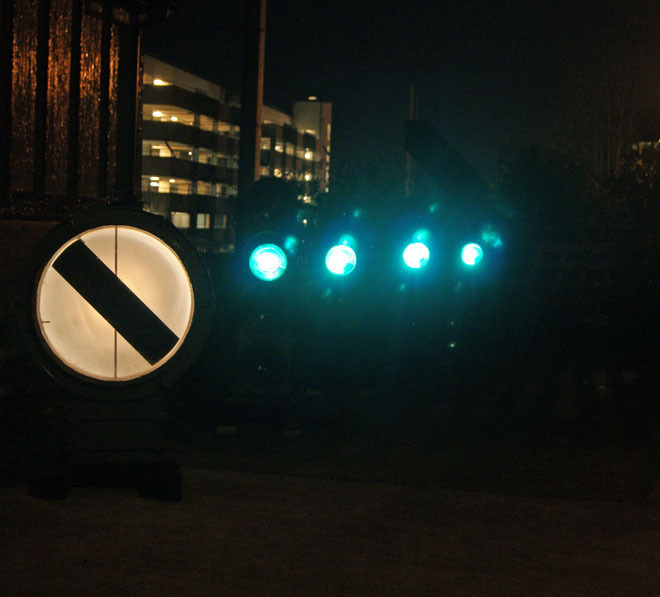 The first (left-hand) picture shows the signals all at green. 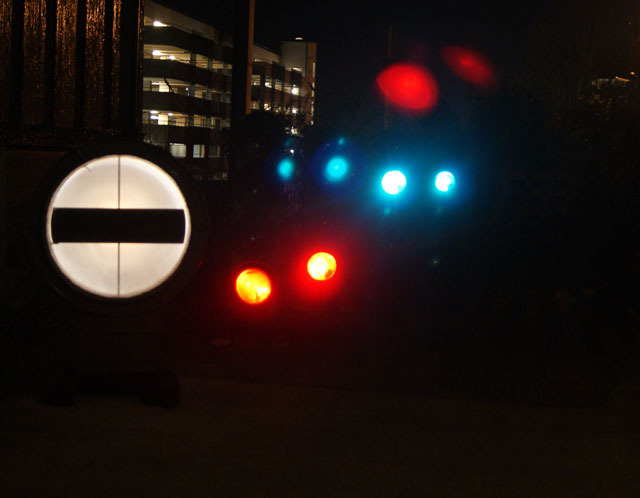 The second (centre) picture shows the sequence just after the 'train' has passed the second signal but not cleared the 'overlap' that is beyond signal 2. 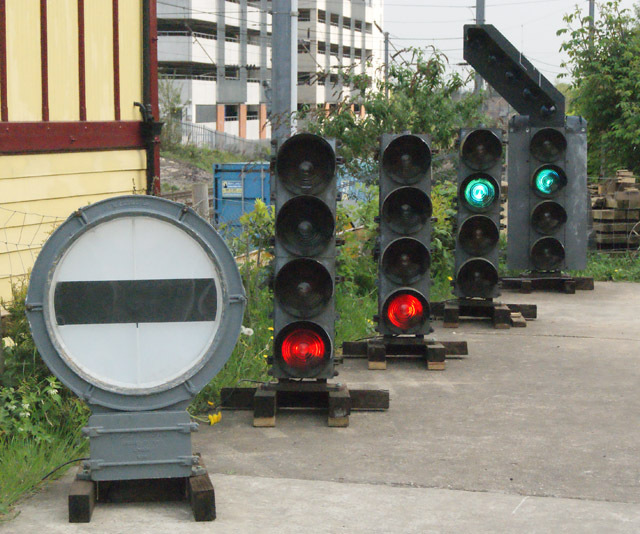 The last (right-hand) picture shows the 'train' approaching the last signal to take the diverging path to the left, as shown by the lit 'Feather' or Junction Indicator. 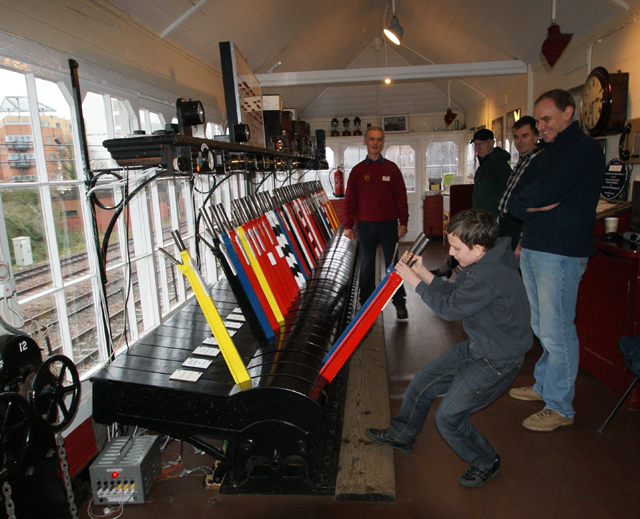 Visitors leaving the Open Afternoon on the 13th of March were able to see the first stage of the colour light signal demonstration working at last. 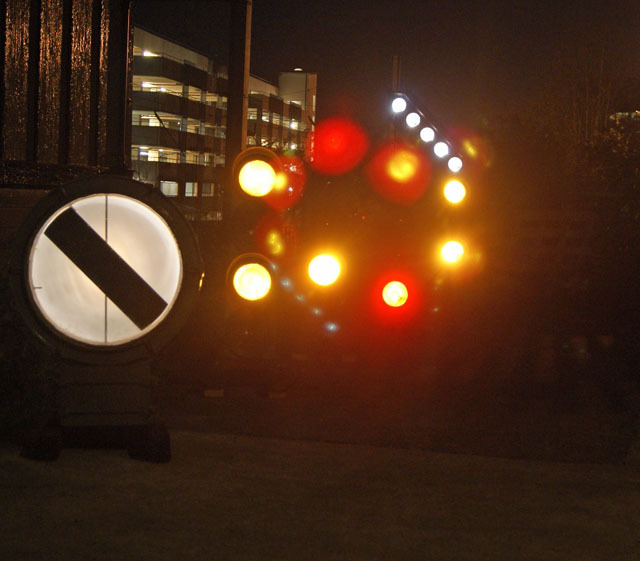 The left-hand picture shows the first signal at 'Danger' (Red). 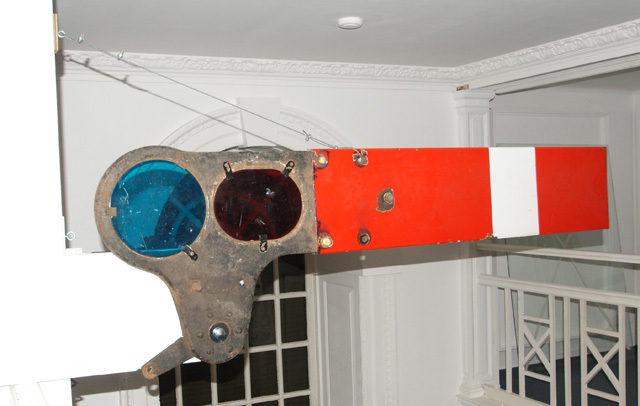 The Banner Repeater - the signal at the front with a black bar on a white background - is connected to the first colour light signal and shows that it is at danger. 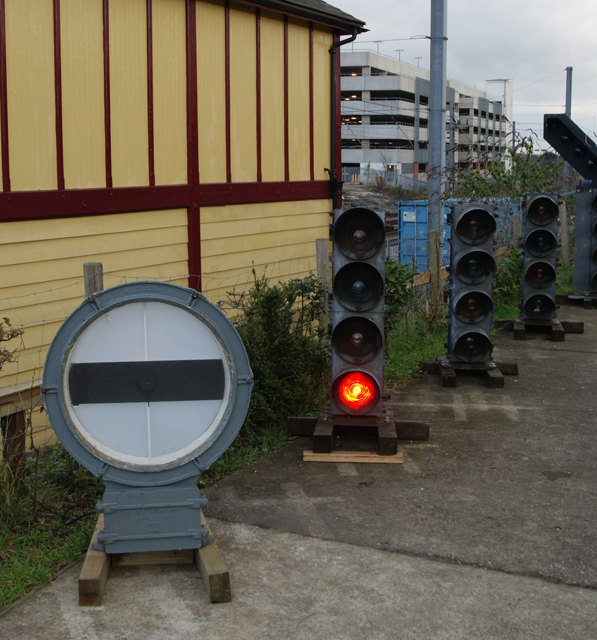 Work will go on over the next month to get all the signals working - we hope to complete the demonstration by our Easter Day opening on April 24th. The photos show several of the items lent from the signal box including our Banner Repeater, platform scales, No Trespassing sign, block instrument, Hatfield No 2 box diagram and a rather oddly mounted signal arm! 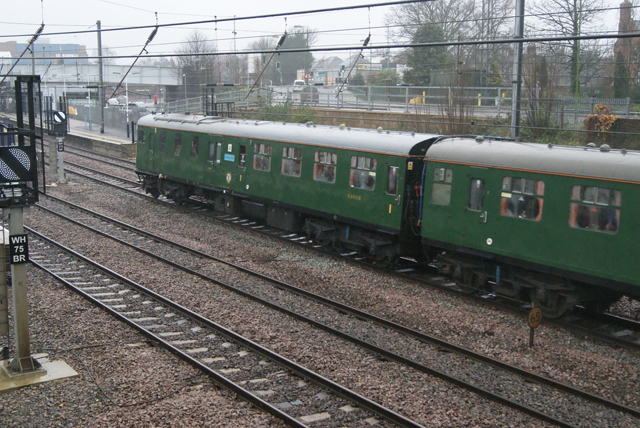 The preserved 'Hastings' DEMU (Class 201) called at St Albans on its way to Bedford and Bletchley, on a trip delayed from December 2010 due to the 'Arctic' weather then prevailing. 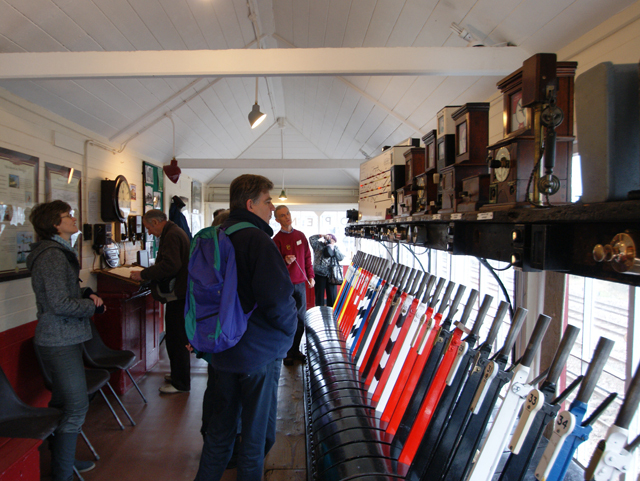 The box was open from 12 noon to 4pm and around 60 visitors, both from the train and elsewhere came to the box. Several of the signal box members in turn enjoyed a trip on the train! As well as ticket number 5000, Alexander was given a certificate to mark the occasion, a couple of our unique model railway wagons and other goodies. He was treated to a demonstration of a train passing from Harpenden to Napsbury and then allowed to have a go himself. 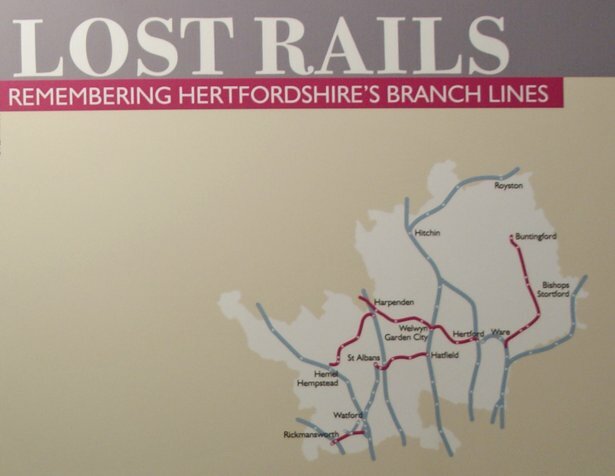 In January we had four open days from 10am to 4pm - the first two were on the 15th/16th in parallel with the Chiltern Model Railway Association's annual exhibition at the Alban Arena. Once again the organisers were kind enough to mention us in their show guide and to put up posters around the show. Some 170 people called in over the weekend. 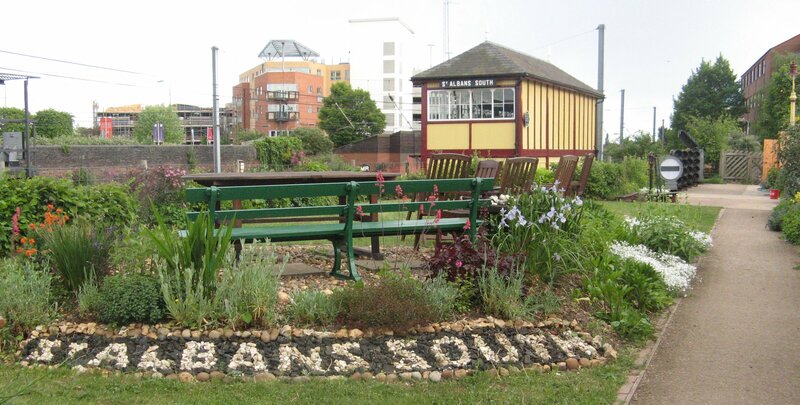 The last two days were the 29th and 30th when we opened for the "St Albans Residents First" weekend. (This weekend is held to encourage local people to find out about local attractions so they can bring visitors along later in the year.) We were rather busier with some 538 visitors over the two days - the picture shows one of the quieter moments of the weekend.